As you can see, it's quite simple and more importantly - it only needs one person to construct. The Scoop is suitable from 6 months although it is recommended that babies should use the chair with the removable seat insert which is sold separately. The seat insert just makes the highchair more snug and secure for smaller babies as it reduces the interior size of the seat. I did feel a little down-hearted when I realised that the insert wasn't included but I was confident that with the optional harness, 8 month old Little E wouldn't have any problems. The only issue we had in not using the insert was that Little E is still a little bit wobbly. She is prone to jerking backwards and therefore would bang her head on the back of the seat so we just pop a towel on the back, just in case. You can see from the image below how Little E fits in to the highchair - she's quite petite for 8 months old but she's secure and she loves being high up in the chair. In the past I've struggled with high chairs as they can be so hard to clean. This is where the Scoop excels on every other high chair I've used. There's no cloth to be stained, no straps to be soiled, no difficult cover to remove and wash in the middle of the night so that baby can still use the high chair again the next day. Every part of the chair can just be wiped clean. There aren't even any nooks and cranny's to cause any issues. The addition of a table insert could be good as it would allow for a thorough clean in the dishwasher but it's still perfect without. The scoop has lots of added features that you don't usually expect from a highchair. 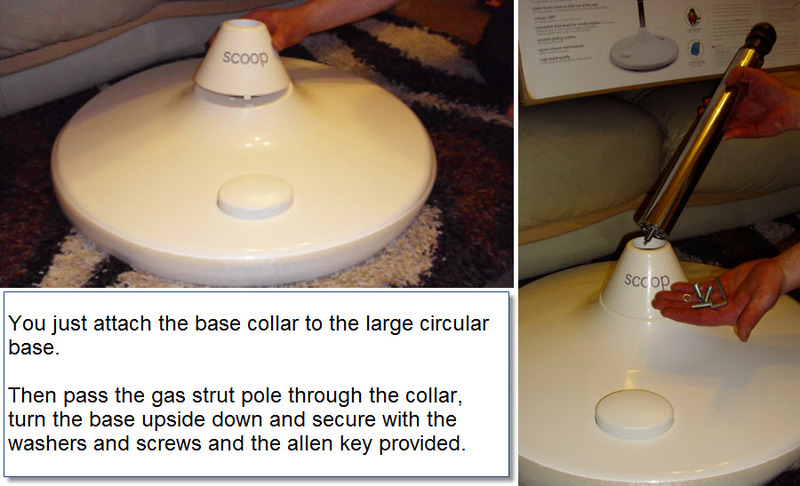 The Scoop has a small lever handle just under the table attachment which allows the table to slide clear of the seat. This means that it was really easy to put Little E in to the highchair and secure her simply by holding on to her with one hand and moving the table up to her body with the other. 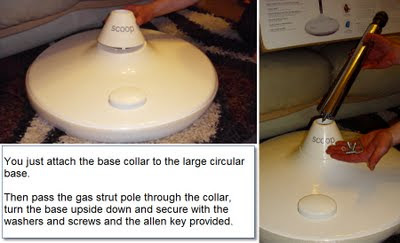 The Scoop rotates through 360 degrees which I thought would mean Mister A would attempt to spin Little E around and around. 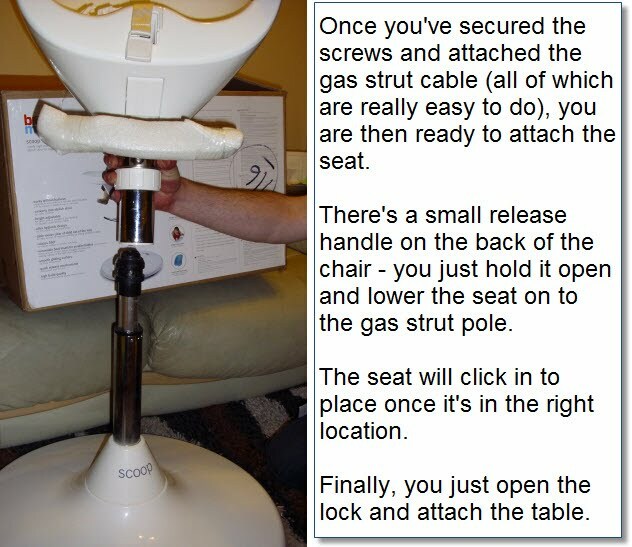 Don't worry though, the chair swivels and locks every 90 degrees. 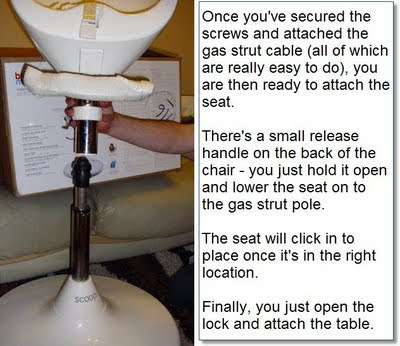 Due to the gas mechanism you just press the large button on the base with your foot to lifetthe chair to your desired height. The great thing about the height adjuster is that you can use it to adjust to the height of any table, sofa or breakfast bar so you won't have a moment like we did one Christmas where Mister A's legs wouldn't fit under the table! The poor child had to sit about a metre away from the rest of us. With the Scoop there'll be no issue. The Scoop is quite a hefty high chair so it's castors are a must. There are 2 castors and 4 height adjustable legs on the base so if your floor's uneven you can adjust the legs to compensate. So you're probably wondering why there isn't a beaming picture of Mister A trialling the high chair. The truth is, we just can't tell him that if we removed the table he could use it as a stool because he'd want to sit in it all the time - Thus leaving Little E without a high chair. It's great that we'll be able to use it for many years to come but so as not to cause any sibling squabbles I think we'll just keep schtum! We really love the Scoop with it's clean lines and modern look, we're proud to have it in our home. It's easy to clean, easy to put baby in to, easy everything. The only down side to it is that it's so large. I'm used to having a high chair that can be folded and stored out of sight and clearly this can't be put away but the practicality of this chair makes for a winning product. I can highly recommend the Brother Max Scoop. Disclosure: We received the Brother Max Scoop High Chair at no charge, to enable us to post this review.